Few experiences in life were more beneficial to me than the lessons learned from competing in high school track and field. Other learning experiences came from my earlier involvement with baseball and later mid-life involvement with tennis. Most revelations were of the positive kind; a few were not, of course. My two track events in high school were the high and the low hurdles. I am the proud possessor of two gold track medals and a bronze! 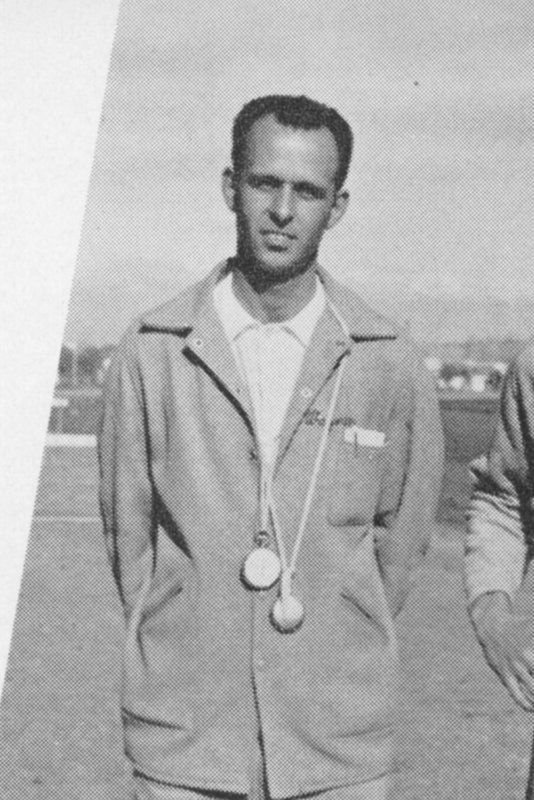 No, they are not from running track at the Olympics, but from my 1958 senior year in track at San Mateo High School! Yes, I know, the gulf between such accolades is immense, but those awards, nevertheless, mean a great deal to me because of life-lessons learned along the athletic path leading to May 9, 1958 when they were handed to me by our high school track coach. That little “ceremony” took place on the infield of Burlingame High School’s track, the site of our Peninsula League meet finals that afternoon. On that day, the San Mateo High Bearcats pulled off a most surprising local sports upset by defeating the heavily-favored Burlingame Panthers for the league track and field title. 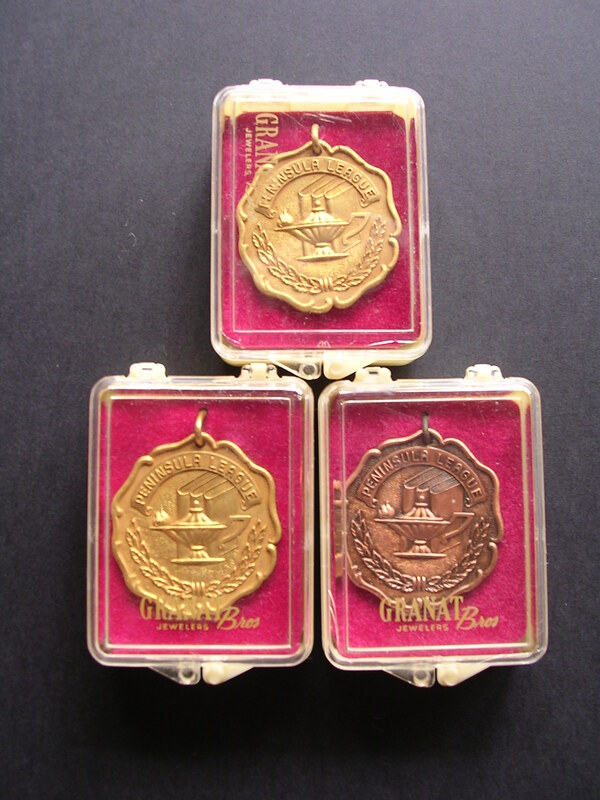 Every team member was awarded a gold medal for the team victory. The other gold is the one that means the most to me, for it symbolizes my victory in the league meet over the best high-hurdlers from the other schools in our league. 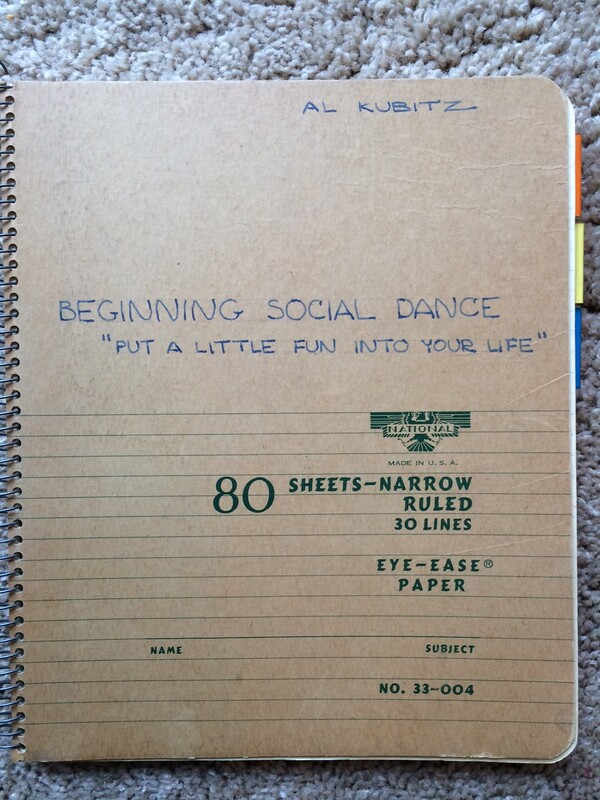 It remains one of my most prized possessions. The bronze medal was awarded for finishing third in the low hurdles final. Overall, I had a very good senior year in track in 1958. The 120 yard high hurdles race was run over ten 39 inch barriers spaced ten yards apart. At the Olympic level, the race is an equivalent 110 meters over ten 42 inch barriers – a height well above most people’s navel. The world record in the 110 meter high hurdles is just under 13 seconds, today – a phenomenal feat of speed and athleticism. Although reasonably coordinated, I recall my frustration with kick-ball as the ball squirted off my foot at an angle and low to the ground, kick after kick. I also recall the towering shots that inevitably came off the foot of a female classmate, Lela Mae. I can still picture her: Slightly pudgy, with freckled cheeks, hair in hanging ringlets, and a booming foot that regularly sent the ball over the outfielders for home-runs. Likewise in dodge-ball: When Lela Mae tagged you with the ball, it really stung! Donald, another classmate, also seemed so much better than the rest of us in these events. 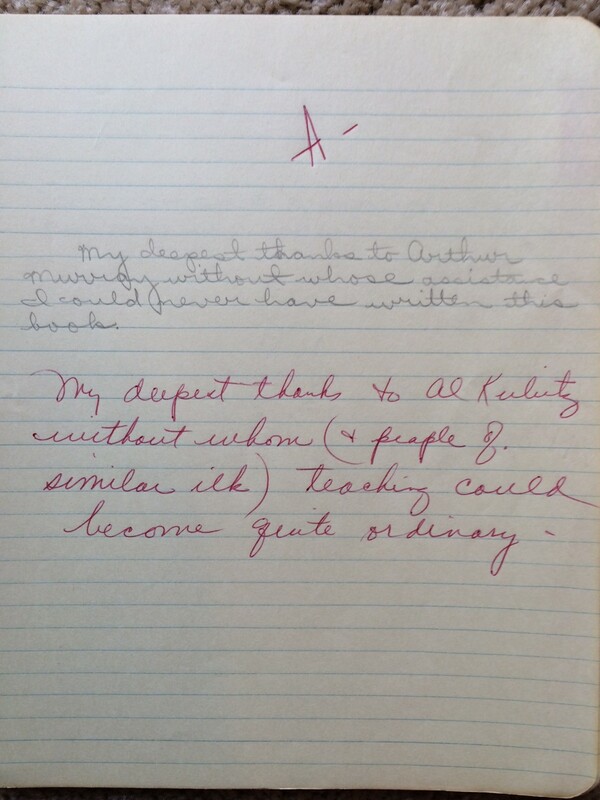 Throughout grade school, I was never the first to be chosen for P.E. or recess teams; luckily, I was not one of the last, either! Thus it was with early grade school athletic experiences. I did begin to notice, however, that when the P.E. teacher had us run sprint races, I was inevitably one of the two or three fastest in the class. In high school, I tried out for freshman/sophomore baseball and got a uniform, but rarely played. I came to high school baseball with no real playing experience except hours spent in the backyard playing “catch” with playmates or with my dad in earlier years. Initially, I excelled at one thing as an aspiring outfielder: When coach would hit us long fly-balls in practice, I was quick to run up on the ball…only to realize far too late that it was sailing over my head! Quite embarrassing, initially, but I did catch-on and became a decent outfielder. I was a lousy hitter, however – a sure ticket to the bench. Despite my lack of baseball accomplishments, I learned about team sports and what is required of a good ballplayer. I know that Coach Alexander was impressed with my hustle and attitude in practice; my good example, not my inherent ability, was what earned me a uniform. At the end of sophomore year, I got in the habit of stopping by the track team’s high-jump pit on the way in to the locker room after baseball practice. I found I could clear close to five feet using the outmoded scissors-kick style I had learned as a youngster from my dad. I became interested and arranged for an informal “try-out” one afternoon with the track and field coach, Berny Wagner. I impressed him by clearing five feet in my tennies and sweat-pants. We both thought I had a future in the high-jump on next year’s track team. Accordingly, I went out for the cross-country team that fall term to build my legs and my endurance. It was no surprise to me that I was regularly bringing-up-the-rear in our meets since distance running was never a strong point. I was in it strictly for the conditioning and track, but I worked hard at it. I recall one race which took us past a pig farm in South San Francisco. What an experience, gasping for breath only to run directly into a fog of pig stench! It was awful, but humorous… in hindsight! While running cross-country, I worked on high-jumping technique and learned to run hurdles since that that exercise was supposed to build leg-strength and “spring.” Well, what “spring” I did have deserted me, and I never was able to clear five feet again in the high jump to Coach Wagner’s dismay (never indicated) and my bitter disappointment. Fortunately, I began to be seduced by the hurdles, especially the highs, and it all was making perfect sense. I had good foot-speed, but not good enough to compete as a sprinter: Those were the guys who always won those grade school P.E. races and naturally found their way to the track team in high school. Sprinters often have a more muscular build which is not conducive to negotiating ten 39 inch barriers…at speed. I also was tall, lanky, and limber through the hips – prime attributes for a high hurdler. I did face tough competition from sprinter-types in the low hurdles, however, where technique and limber hips are not so necessary. I grew to love running the high hurdles where the rhythmic three-steps between the ten hurdles allows the runner to really find his “groove” in the race when all is going well. When things go bad in the hurdles, they can go very bad. Hitting one of the weighted hurdles (they do not tip easily) with any significant force can knock the runner off-balance or cause him to lose momentum and his ability to maintain the three steps between hurdles. At that point, the runner is “toast” and the race us lost. Often, runners fall to the track after a collision with the barriers and are in danger of being spiked by the runners in adjacent lanes. And then there is the not- uncommon discovery at the finish line of a bloody “knob” on the trailing-leg knee from contact with a hurdle. Hurdling is not for the faint-of-heart. The good news: I was enjoying hurdles practice and felt compatible with the demands of the event, especially in the high hurdles. I felt I had a chance! The bad news: In my junior year, my first competitive year in track, San Mateo High had three of the very best high hurdlers in the entire league. Our star hurdler, Bob Kile, was a natural athlete with speed who was also tops in the pole-vault and a star halfback on the varsity football team. 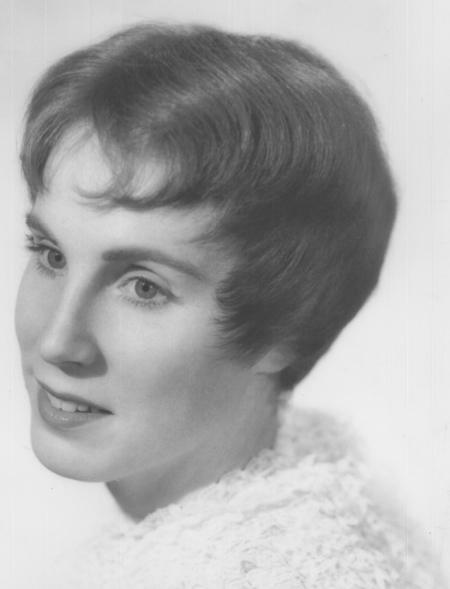 Dale Lebeck was a fine broad jumper as well as hurdler. Al Holmes was one of the best high jumpers in the league. It was a learning year for me. I placed third in the hurdles once or twice when a lane was available, but I learned a lot watching these three fine athletes practice and compete. The good news: All three of these hurdlers were seniors who would not be returning next year!! I saw my chance, and I threw myself, heart and soul, into becoming a good hurdler. I practiced hard and late during sixth-period P.E. and after school. Often, I walked home from school – probably a mile and a half to two miles – after two tiring hours on the track. I read books on hurdling technique, and I did stretching exercises every evening before bedtime. I fantasized about being league champion someday as I mowed our back lawn. Basically, I lived an existence heavily focused on track which has allowed me, ever since, to fully appreciate the intensity and focus which is necessary for competition at the Olympic Games. Of course, I have no illusions about the magnitude of my high school experience compared to that of the Olympic Games, but the lessons I learned taught me about self-discipline, perseverance, and dedication to a goal. I learned, too, that year, how socially beneficial athletic success can be. 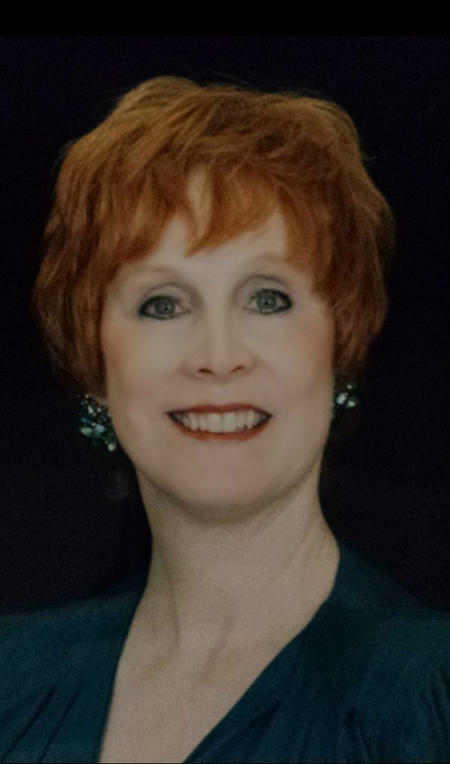 In those days, track and field was quite a popular sport, and my hurdling brought me to the attention of classmates who were outside of my closer circle – an experience that was new to me given my athletic struggles of the past. It all made for a wonderful senior year. Would that all youngsters could have a similar experience and learn the life-lessons that I did because of track. 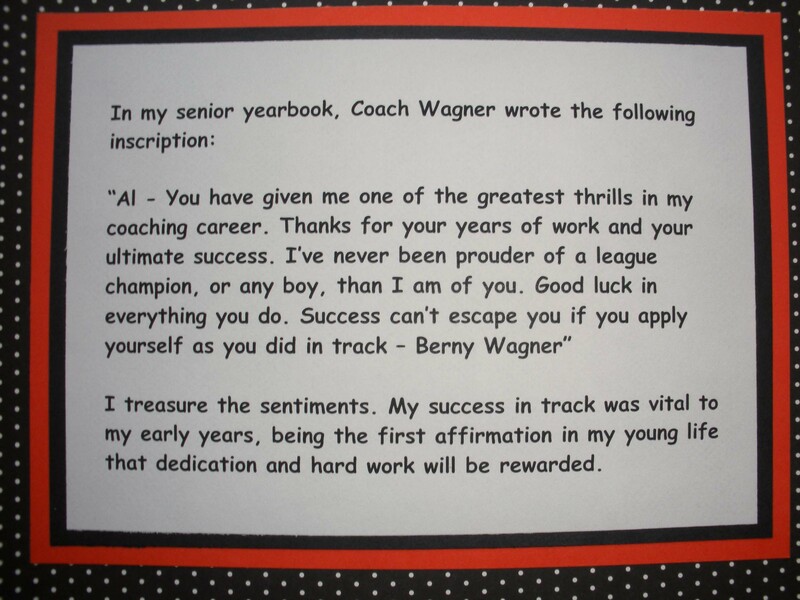 I owe my success in track to our track coach, Berny Wagner, who passed away last year. Coach Wagner positively affected my life more than any other teacher/educator in all my formative years. I intend to write more about Coach Wagner in a future post. 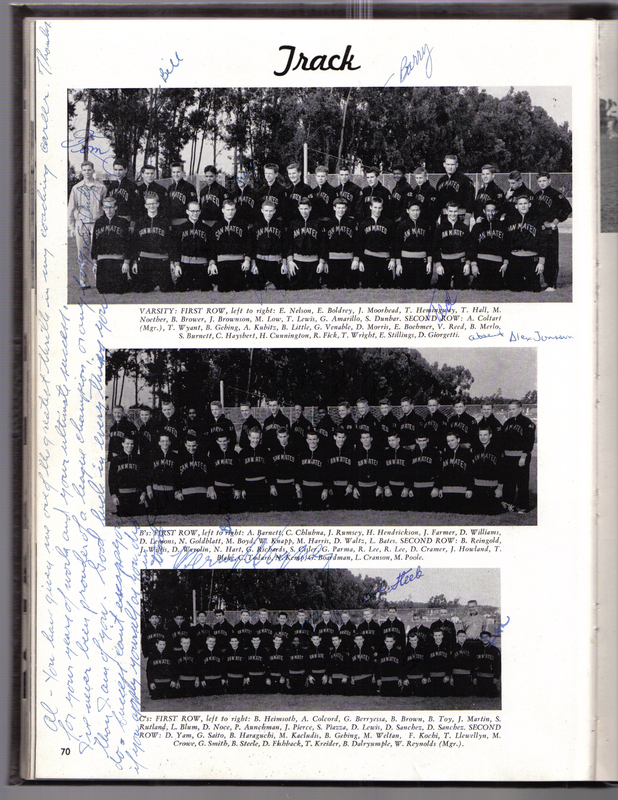 Suffice it to say, his inscription in my senior yearbook just before graduation illustrates the kind of mentor he was to the fortunate lads who crossed his coaching path …in high school and, ultimately, at Oregon State University. The “greatest thrills” in his coaching career were still to come!